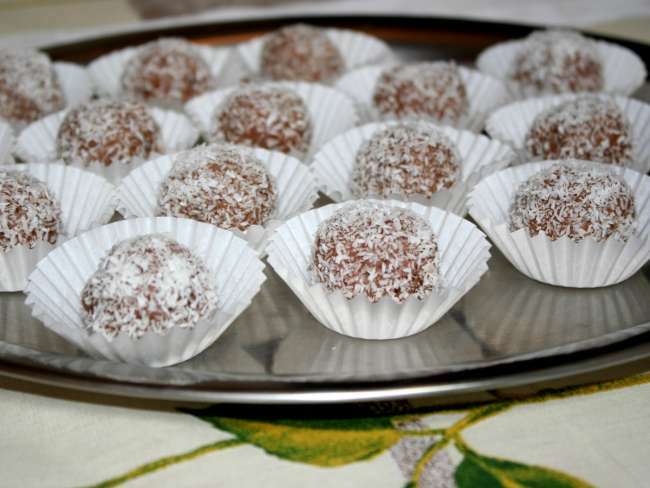 We bring you traditional recipe for coconut balls, which has two variations. Use leftovers of the cakes when you are baking or prepare them from the crushed sponge finger biscuits. Mix to combine crushed sponge finger biscuits, grated coconut, vanilla and powdered sugar, melted chocolate, jam, rum and butter and work pastry. Form small balls from the pastry, coat them in the grated coconut and place in the paper baking cups. If you bake several types of desserts and you have some leftovers, mix them with jam, rum, coconut and butter when necessary, so that you have the correct consistency and again form small balls and coat them in coconut.